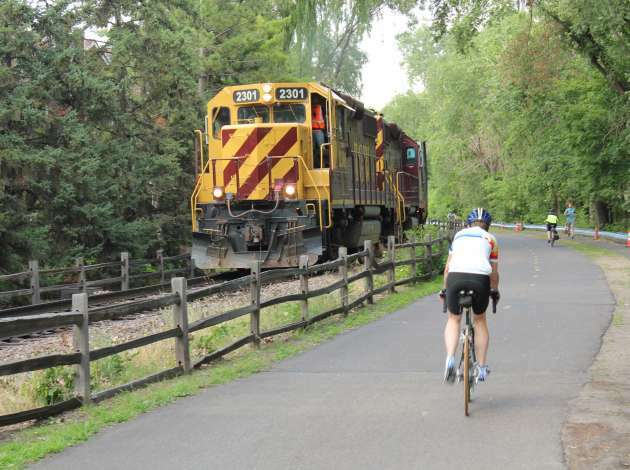 The narrow Kenilworth Corridor is already home to a path and freight rail line. A key vote on Southwest Light Rail Transit will be delayed, Gov. Mark Dayton announced Tuesday after a meeting with local officials. The Metropolitan Council was scheduled to vote Wednesday on a plan that would route the train as it passes through Minneapolis’ Kenilworth Corridor through two shallow tunnels. Just what to do with the train and an existing freight line in the wooded recreation area that passes between two lakes has been a major sticking point in the LRT plan. Delaying a vote on the $1.56-billion project will allow for more study of alternatives for rerouting freight rail and the potential impact on the Chain of Lakes if the shallow tunnels are dug. On Monday, the Met Council’s Transportation Committee advanced the plan for the 14.5-mile line to the full Met Council without a recommendation. The Star Tribune reported the vote will be delayed 60–90 days, but a spokesman for the governor could not confirm that timetable Tuesday afternoon. A Met Council spokesperson did not immediately return a call for comment. John Stiles, communications director for Mayor R.T. Rybak, said the mayor was present at the meeting but left before it was concluded. Minneapolis’ official position has long been that if LRT comes to Kenilworth, freight must go. In the 1990s, St. Louis Park officials committed to eventually taking freight rail in exchange for $4.75 million to clean up a superfund site, but that agreement was not legally binding. There is vehement opposition in the western suburb to the freight rail rerouting plan, which would require the taking of more than 30 homes and businesses and elevate tracks on a berm up to two stories tall. Rybak has argued the $200 million worth of improvements Twin Cities & Western Railroad Co. is demanding amount to a “Cadillac plan” for the reroute. Rybak and other city leaders pushed for an alternatives study to identify other, potentially less expensive and disruptive freight reroute options. Met Council brought in a Colorado-based consultant in September, but the firm’s team backed out of the project after a closed-door meeting with railroad officials, citing a conflict of interest. Instead of meeting Minneapolis’ officials request to hire a different rail consultant, the Met Council then pushed ahead toward a vote. Minneapolis officials have also asked for more study of the shallow tunnel plan’s potential impact on water quality, lake levels and the flow of groundwater in the Chain of Lakes area. Any delay on the project raises concerns that Southwest LRT could slip in the queue for federal funding. Federal dollars are expected to cover about half of all project costs, and the local transit project is one of many around the country in line for that funding. Met Council officials also warned a delay would add $40 million–$50 million to the project each year. Earlier this month, Minneapolis City Council members opposed openly discussed denying the project municipal consent, the legal OK required of every local government along the route. That could move Southwest LRT into the courts, leading to an extensive delay or even endangering the transit project, which is believed to be the largest in state history. About 220 light rail trains per day are expected to pass through the Kenilworth Corridor when the line begins operations in 2018. Some residents along the corridor support the shallow tunnel plan because it would mostly hide those trains from view. Many others, though, have expressed their disappointment in the process that led to the shallow tunnel proposal. A group protesting the shallow tunnel plan gathered last week outside of Kenwood Recreation Center during a Met Council open house on the plan. Tina Smith, chief of staff for Gov. Dayton, said Tuesday afternoon the 60–90-day postponement of the Met Council vote is not an official timeline. Smith said it was the amount of time Met Council Chair Susan Haigh suggested it might take to answer Minneapolis’ questions about alternatives to the freight rerouting plan and the tunnels’ potential impacts on the Chain of Lakes. Haigh was among a group of state and local officials in the room with Dayton for the meeting. “I think that the spirit in the room was very much that this is one of the most important projects for the region, and that there are still some persistent questions that need to be answered,” Smith said. She said the others present at the meeting were: Hennepin County commissioners Gail Dorfman and Peter McLaughlin, who both represent portions of Minneapolis; Rybak; Haigh and members of the Southwest LRT project staff; and DFL state representatives Scott Dibble, Frank Hornstein and Paul Thissen. “The governor has been following this issue closely,” Smith said. “It’s up to the Met Council and the communities the train will go through to decide the right alignment and what makes sense for the communities. This entry was posted in Southwest LRT and tagged Southwest Light Rail Transit on October 17, 2013 by citoyen1789.